Just in case it's hard to figure out, we are in love with all things beer and barbecue, and we're excited to share our passions with you, and hope that you will come to love a few of our favorite things in the process. We'll share some of our more interesting adventures in home brewing, along with some of our favorite craft brews that are available locally, and some that are distributed across the country. We'll share a few of the techniques that seem to work best for us and let you know what type of equipment we recommend for different projects, both brewing and 'q-ing. We'll be sure to type up some of our favorite and more successful recipes for both as well. Combine all of that with recommendations for which local restaurants we think are serving the best drafts and bottles, and which breweries regularly host our favorite food trucks that we think are worth checking out, and you've got a combination as good as, well, Brew and 'Que! 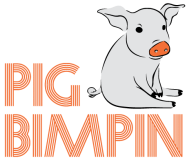 Thanks for stopping by Pig Bimpin'! Americans seem to have a new found love and fascination with all things craft beer. You would be surprised at the variety of different ingredients that can be commonly found mingling with the basic barley, yeast and hops of traditional brews - coffee, chocolate, pumpkin, grapefruit - you name it, and someone has probably attempted some sort of concoction with it (not that they've all been successful). Since home brewing equipment is more readily available than ever, through the power of the internet and local home brew shops springing up, it's much easier to find the perfect blend of ingredients to create your own favorite brew and share with your friends. While we want to primarily focus on, as you can probably tell, beer and barbecue, not everything in our lives fits into one of those two categories. Shocking, I know. So, if we've got something else on our minds that we want to share, it'll go to the blog. Whether you're an avid fan of a good Memphis dry rubbed rack of ribs or would rather slather your chopped brisket sandwich in spicy hot sauce, barbecuing is a wonderful and versatile way to cook up some delicious grub, and is a favorite for parties and picnics, since it's often cooked in big batches to share with friends and family. (Or, you know, keep it all for yourself. We've definitely done it before and we'll do it again, so we won't judge.) With different styles hailing from different regions of the country, and recipes readily available for a variety of different meats and other dishes to throw on the grill, there's always going to be some new 'que to try. Who doesn't love a little bit of character development? You can find some background information about us on this particular page, and maybe get a little insight into why on earth we wanted to create this website to begin with. Or maybe not, you'll just have to click and see.